While research on the growing and highly influential digital and creative industries has been well-represented in recent years, this session signifies a departure from mainstream research on digital and creative industries towards more exploratory research of the social spaces in and through which, digital and creative work is occupied and shaped. As such it welcomes contributions in the form of case studies, new empirical methods, and conceptual pieces relating to networks, social spaces, urban subcultures, working practices, and even ‘underground’ spaces (Cohendet et al., 2011) relating to this group of workers – as a way of broadening our understanding about how these new economic activities operate in practice. The broader context for the session relates to our understanding of this broad and emergent area of the economy, which continues to be dominated by traditional research methods, especially those relating to ‘sectors’, ‘occupations’, ‘places’ and ‘spaces’. Yet, there is compelling evidence that this group of activities are shaped, organized and can be better understood, through more imaginative spatial constructs. These workers, more than others, appear to be at the vanguard of a changing economy and society – with new working methods and practices – representing a break with the past, which calls for more nuanced research approaches. Categories: Creative Industries, Freelancers, Human Geography | Tags: Call for papers, RGS-IBG 2012 | Permalink. Having just given a keynote talk at the Creative Exchange (slides above, or if you’re browser isn’t letting you see them, click here), it has been a genuinely invigorating experience to talk to and get feedback from creative industry businesses, entrepreneurs and freelance workers. The talks and Q&A sessions all had stimulating content with tangible repercussions for how creative industry business can collaborate, access finance and reach their audience (whoever that may be). You can relive the day through the twitter stream, #CE11. Categories: Creative Industries, Freelancers, Innovation | Tags: Creative Industries | Permalink. The creative industries seem to have reached somewhat of a plateau in recent years in terms of their progression as a concept or vehicle for improving our economic competencies. I don’t mean in terms of actual economic performance, indeed David Harte recently blogged about how the creative industries may be experiencing a slowdown, which is in contrast to much of the rhetoric that surrounds them. Instead, the UK government has seemingly entrenched them as an industrial concept, yet the practitioners are constantly challenging the status quo by pushing creative boundaries and fueling some of the most important innovations in the field. 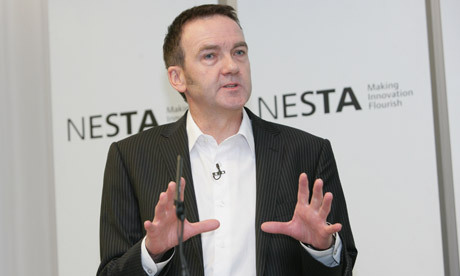 I was lucky enough to be invited to hear Andy Duncan speak at NESTA this morning and I was reassured to hear that he resonated these sentiments, saying that the creative industries and the changes inherent in them, needs to be fully on the government’s radar. As well as vehemently rejecting Mark Thompson’s call for a merger between Channel 4 and Channel 5 (a rejection which is echoed by Jemery Warner), the other major point that I took away was his ambition to make Channel 4 (particularly the 4IP scheme) what he described as ‘a tool making factory’ rather than a ‘content factory’ (I’m paraphrasing as given the start time of the talk, I refused to start taking notes until I had finished my coffee). Basically, his point was that he wanted to equip people with the tools to be able to generate the content themselves, rather than simply funding people with good content-ideas. This reminded me of the Oxfam advert (which used an old Lao Zhu quote) which says “give a man a fish and you feed him for a day. Teach him how to fish and you feed him for a lifetime”. As Andy Duncan mentioned briefly, we will need better regulation for content; as we saw with the Brand/Ross affair, Ofcom’s mechanism for regulation prompted (what most people agreed to be) an over-the-top reaction from the BBC, but citizen-generated content would only lead to more ‘extremes’ in content which would need more sensible regulation. Individualisation of content generation would, in my view, lead to an overall deterioration of quality as the best content is usually generated through collaborative action (I realise this not always the case though). Therefore, the importance of ‘creative clusters’ will increase; be these virtual or physical (i.e. what is going on at Salford University at the moment), we will need to foster and encourage collaborative action, and importantly, allow failure and legislate for it, i.e. allow creative people to take more risks. Creative Quarters and the role of universities will be crucial in this, and I have a paper coming out soon in the Creative Industries Journal which emphasises this very point. Finally, a more intuitive funding structure which has at the moment breadth but little depth (in most creative fields anyway). Spreading the pot thinly is great for picking up the ‘distant’ talents that would not otherwise get the break, but sometimes its worth putting at least some eggs in one basket by financially backing proven talent more generously than is currently available. As someone who has debated the UK government’s conceptualisation of the creative industries (see my first ever blog entry), it was refreshing to hear someone of Duncan’s standing attempting to drive forward and challenge the government’s stance on the creative industries, but it will remain to be seen if the policy makers have been taking heed of this debate. The rapid increase of Web 2.0 capabilities and the technological developments that are fueling them, means that the change in content-generation that Duncan talked about will happen sooner rather than later (he predicted the next 5-10 years) and so the issues raised above will need to be tackled quickly. The recession will only exacerbate this desire, as we (society, government, businesses) look to the creative and knowledge industries for the next source of Britain’s global competitiveness. We best not let them down! Categories: Andy Duncan, Creative Industries, DCMS, Freelancers | Tags: Andy Duncan, Creative Industries | Permalink. There remain very few industrial sectors in which freelancers do not operate, yet they remain peculiarly absent from the mainstream academic literature (when it does, it exists sporadically). Focusing on, and researching these freelancers holds particular relevance to the creative industries, as much of the work undertaken is project-based, with temporary, short-term and often part-time contracts (Grabher, 2004a, 2004b; Oakely, 2004; Creative and Cultural Skills, 2005; Design Council, 2005; Rifkin, 2005; Christopherson, 2006; Davenport, 2006) – and freelancers saturate this type of labour organisation. The highly fluid, mobile and staccato nature of freelance work means that they are rarely captured by official statistics and industry bodies, and hence difficult to research quantitatively. A fact even recognised by the UK government’s Departure for Culture Media and Sport (DCMS) who are responsible for compiling government statistics and formulating policies for the creative industries in the UK (DCMS, 2005). The firm is often theorised as a seemingly single point or ‘black-box’ which should be the sole unit of calculation (Williamson, 1990). Grabher suggests that firms enjoy(ed) an “ontological and epistemological advantage”, and “remain unproblematized as a unitary and coherent actor (Grabher, 2004: 105). However, this unproblematic view of the firm has been challenged by more recent authors (see Taylor and Asheim, 2001; Yeung, 2005a, 2006; Glücker, 2006; Jones, 2007) who argue that the black-box needs to be opened and the multiplicity of processes at work (social, political, cultural) need to be analysed. This has led some to adopt a network approach to firms (see Scott, 2004, 2005 for this usage in the creative industries) in order to mirror the organisational shift in firms from traditional vertically integrated and hierarchical structures to inter-firm, project-based ‘horizontal’ organisations (Dicken et al., 2001; Hadjimichalis and Hudson, 2006). However, reading these literatures, it is possible to notice the absence of any empirical contribution, or indeed theoretical recognition of freelancers. This is slightly perplexing as many of the world’s most ‘experienced’ industries (music, film, television, computer games, theatre, fashion and so on) operate around individual workers (musicians, film stars, directors, artists and so on), people who transcend particular cities or places and generate huge amounts of wealth and income not only for themselves but for the firms they work for (or the people they employ). Therefore, there is a need to include all those other workers who contribute to the economic landscape and not just the established firm. Moreover, the creative industries are dominated by project-based labour (Christopherson, 2002, 2004, 2006; Grabher, 2004; Oakley, 2004; Davenport, 2006; Mould, 2007) and so if we are to satisfactorily analyse the practices that construct these projects, then there is a need to make room for the inclusion of freelancers. The literature on creative industries seems to be very much dispersed across many different disciplines in the social sciences, including management studies, organisational studies, risk management, sociology, marketing and so on (Roodhouse, 2006a). As a result, many of the empirical agendas within these industries remain highly detailed, focused on a specific sub-sector within the creative industries, or even on particular firm or project (for example Dempster, 2006). And, as much of the research conducted on freelancers is infused into research into creative industries (and hence even more specialised) there exists a somewhat ephemeral and ‘messy’ literature. There are very few studies that highlight freelancers (primarily because they can be difficult to identify and survey), but one of the most comprehensive studies to concentrate on freelance work was conducted by the UK Design Council (2005), which collected data on all the design firms (both in-house design teams and design consultancies) and freelancers. It states that the UK has 47,400 freelance and self-employed designers in the UK, with 59 per cent of all design firms in the UK employing less than five people. While this gives us a quantitative insight into the relative size of the freelance population (of just one sub-sector of the creative industries) it says little regarding how these freelancers work, or how they collaborate with each other (and other firms) on particular projects. This report mirrors many other reports written by the specific sub-sectors council (such as the UK Film Council, the UK Crafts Council and so on), in that they are focusing on their own sub-sectors workers. This is necessary from a policy perspective (as they are funded to carry out this type of work), however, this practice creates unnecessary (and artificial (Christophers (2007)) boundaries between these sub-sectors. This networking is evident particularly with those freelancers involved in the production of films and television programmes. With perhaps the exception of Hollywood (Christopherson, 2006), the film producing locales around the world have a high freelance population. In Hollywood, filmmaking is dominated by a number of large production firms (for example Universal, Twentieth Century Fox – see Scott, 2005 for a comprehensive overview of the so-called ‘majors’). One of the advantages of such large-scale film production companies is that they can fund a feature film from initial conception through to distribution and merchandising (vertical integration (Scott, 2004a, 2005; Currah, 2006; Christopherson, 2006), due to the knowledge that a Hollywood block-buster will make money (through merchandise as well as ticket sales) even if the quality of the film is debated. Indeed Christopherson (2006: 745) notes “media conglomerates are now able to limit the expensive, transaction-intensive process of competing for products from independent producers by producing products within their wholly owned subsidiaries”. This production technique reduces risk and can ultimately leads to increased profits. However, the film and television production industry in many other film-productive countries (or more specifically, cities) works in a less integrated way and involves more self-employed freelance workers. Rifkin (2005: 363, my emphasis) remarks, “…every film production brings together a team of specialised production companies and independent contractors, each with its own expertise, along with the talent. Together, the parties constitute a short-lived network enterprise whose lifespan will be limited to the duration of the project”. The project-based nature of employment in this industry is hence comprehensive, with very few large film producing firms, formulating what has been coined a ‘cottage economy’ (Long, 2005; Gornostaeva, forthcoming). In the UK for example, “the progressive fragmentation of the UK film industry and deregulation in the UK television industry has resulted in almost universal freelance working” (Davenport, 2006: 253), which increases risk and hence intensifies the proliferation of project-based, freelance employment (Dex et al., 2000). This type of project-based work is fundamental not only to the film and television industry, but to the creative industries as a whole, and indeed many other industries (e.g. construction (Grabher, 2004)). It has been suggested, “one thing international analysts of new media work agree on is that the work is project-based” (Christopherson, 2004: 545). The project-based method of production can be counter-intuitive and even (it has been argued) paradoxical as “even the most successful organizations are organized with their future dissolution in mind” (DeFillipi and Aurthur, 1998: 128). However, if we are to comprehend the ‘project-turn’ in employment focus, then this ‘paradox’ must be engaged. While it is obviously crucial to understand the workings of firms, both their internal process and external relations, to fully comprehend their involvement in the economic landscape, one has to consider them along side freelancers as economic producers. We can do this by focusing on a project-led ontology, which is arguably the most productive way of gaining rich, descriptive empirical data on the way in which the creative industries (and other project-led sectors of the economy) work. Categories: Creative Industries, Freelancers | Permalink.